This week I was challenged to create five new versions of some of my images in black and white (it’s called: “the five day black and white challenge” on Google+). Regular readers here know that a huge percentage of my images feature color and to take part in a black and white challenge was a lot of fun for me. If you’d like to find out more about my black and white conversions (and this shot of Sumatran Tiger, Sukacita) then be sure to keep reading after the jump. I love looking at really well done black and white photography. I’ve been to plenty of gallery exhibitions and what I see always blows me away. It’s not that I don’t know how to do them – it’s just a different way of thinking for me. I’ve been shooting a very long time and that includes using film. Back in those days I saw a scene based on the film that was loaded (and the filters on my lens). Today is a bit different since almost every digital camera is capturing full color images. To create a black and white image requires a conversion but removing color isn’t always enough to make a really great looking black and white shot. Without the advantage of color you need to work a bit harder to control how a viewer looks at your image. By selectively darkening and lightening a shot (also called “dodging and burning”) you can create amazing contrast that is the hallmark of good black and white images. But controlling the brightness and darkness of a shot isn’t the only way to direct a viewers eye. Sharpness and blur are also powerful tools for a black and white photographer. In both my color and colorless shots I use all the tools available to me in an effort to achieve my final image. In the case of my shot of Sumatran Tiger, Sukacita, I began with a basic black and white conversion using Photoshop. My tool of choice with this shot was the gradient map adjustment layer. This adjustment layer is a powerful way to get a black and white shot with great contrast in a single click. With the color removed I use three curves adjustment layers (one for dodging, one for burning and one for contrast). Once I have the brightness, darkness, and contrast worked out I then add sharpness to important parts of the image and I apply a little blur to the edges and the background. The end result should be a shot with eye catching contrast – both in brightness as well as sharpness. That’s all for now. Be sure to check back next week for another Featured Image of the Week! 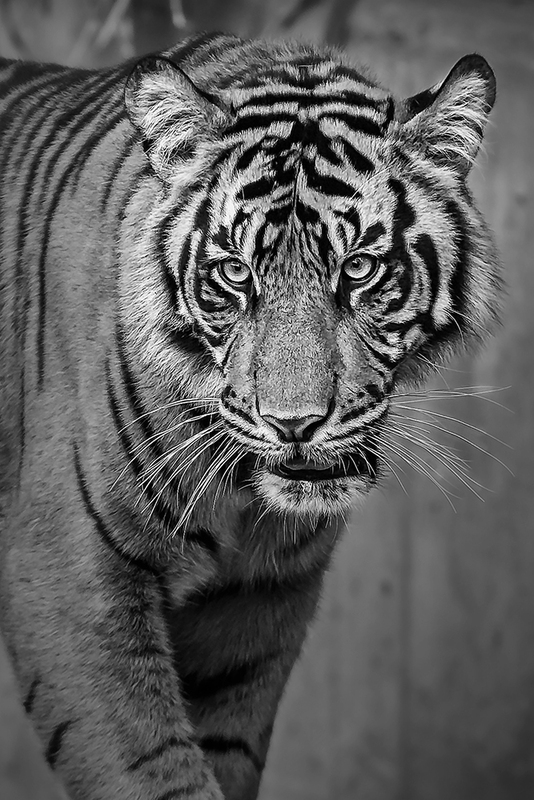 This entry was posted in Featured Image of the Week and tagged black and white photography, featured image of the week, sumatran tiger by Monico. Bookmark the permalink.